But by attending the SOTU as Rep. Bridenstine’s guest, Nye has tacitly endorsed those very policies, and put his own personal brand over the interests of the scientific community at large. Rep. Bridenstine is a controversial nominee who refuses to state that climate change is driven by human activity, and even introduced legislation to remove Earth sciences from NASA’s scientific mission. Further, he’s worked to undermine civil rights, including pushing for crackdowns on immigrants, a ban on gay marriage, and abolishing the Department of Education.More. Save your rage for something more worthwhile. 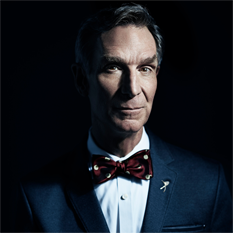 PS: No claim is made here that Bill Nye is a great guy. But this is not worth your effort, compared to the problems back at your desks. See also: Bill Nye would criminalize dissent from human-caused global warming claims.